LINCOLN CITY, OR. 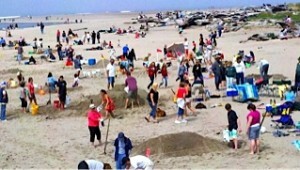 – The 36th Annual Siletz Bay Sand Castle Contest is one of the best deals around. Always a place for the family, the event is one of the historic Taft areas best. On sand castle day the sand from the rocks to the ocean along 51st Street becomes a palette for party-loving residents and visitors alike and the food that goes to the food pantry helps feed local hungry families. Sand castle builders have about four hours to work on their entry before it is judges; photo courtesy Alex Ward. The sand castle building contest, which is by necessity planned around a negative tide, starts at a different time each year. Participants have about four hours to complete their entries before a panel of judges selects the winners. There are themes for sculptors who like to work by theme and open categories for those who do not. This years themes include the Best Mermaid, sponsored by Eleanor’s Undertow; Best Chowder Head, sponsored by Mo’s; Best Tiki, sponsored by Tiki; and Best Traditional Sand Castle, sponsored by Siletz Bay Lodge. First and second prizes are awarded for both themed and open categories. All participants must register at the sign up table on the day of the event, before you begin. There is a Fee of one can or more of food per entrant, which will be donated to the Lincoln City Food Bank, Thank you. Number received upon registration must be displayed by your entry at all times. If it is not visible the entry will not be judged. Choice of sand sculpture is up to you. Keep in mind this is a fun family-oriented event. We ask that your creations be done in respect of this tradition. Entries must be built using only sand, water, shells and other natural beach materials found on the beach that day. hand tools and forms of any sort may be used in the construction process but in no way may support the final sculpture. NO POWER TOOLS ARE ALLOWED. Judging will take place between 3-4pm, winners will be announced shortly thereafter. The award ceremony with prizes will take place on the dock after the winners are announced. Stay with your creation until all judging is completed. YOU MUST BE PRESENT TO WIN! Sorry, professional “Sand Artists” are disqualified from winning. Report all emergencies to the registration table. In addition to the categories above, there will also be various specialized categories to choose from such as The Best Dog, The Best Mermaid, The Best Pirate Ship and more! Come and join in on the fun! Everyone will start after they register. There will no longer be any early starts. You will be disqualified, unable to win a prize, if you start before registering. Thank you for your understanding and helping keep the contest fair for everyone! Also new this year, is that your location on the beach, as far as which side of the dock you can build on, the East or the West side, will be determined based upon your entry. “Other than the 4th of July, this is the biggest event we have in the south bay area,” Ward said. 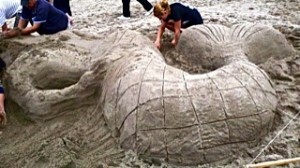 “It also shows that our sand is perfect for a fun day any day. You can find out more on our website, Sand Castle Contest in Lincoln City, but remember, all you have to do is show up.” More information at www.oregoncoast.org.